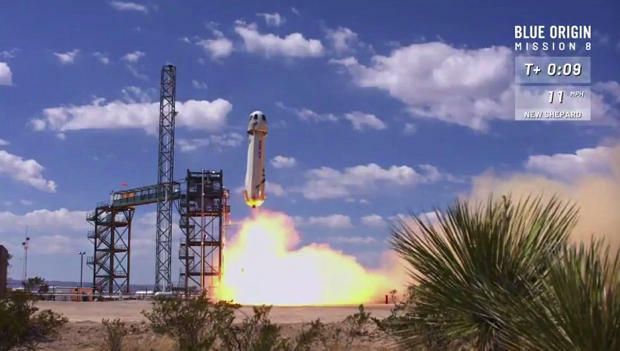 Blue Origin, owned by Amazon CEO Jeff Bezos, launched a New Shepard suborbital capsule from West Texas on Sunday, boosting a suite of microgravity experiments and an instrumented dummy astronaut known as Mannequin Skywalker to the edge of space in the company's eighth test flight. Perched atop a reusable booster powered by a single hydrogen-fueled BE-3 engine, the New Shepard spacecraft blasted off from the company's Van Horn, Texas, test facility at 1:06 p.m. EDT (GMT-4) and smoothly climbed away, generating 110,000 pounds of thrust and trailing a brilliant jet of flame. Designed to carry up to six "space tourists" to altitudes above 62 miles, the widely recognized threshold of space, the unmanned New Shepard capsule separated from its booster, as planned, at an altitude of about 47 miles, before soaring on its own to a height of 351,000 feet, or 66.5 miles. That's nearly 20,000 feet higher than the normally targeted altitude in a bid to "expand the envelope" and gather additional flight data. As it arced over to begin the long fall back to Earth, the capsule experienced four to five minutes of weightlessness before plunging back into the dense lower atmosphere, subjecting the spacecraft to heavy deceleration and about four times the normal force of gravity. The booster, making its second flight, dropped back toward the launch site tail first, re-igniting the BE-3 engine and deploying four landing legs before settling to a landing on a concrete pad near the launch site about eight minutes after takeoff. The New Shepard capsule, also making its second flight, completed a more leisurely descent, slowly falling under three large parachutes before settling to a rocket-assisted touchdown near the launch pad about 11 minutes after launch. It was Blue Origin's eighth New Shepard flight overall and it's seventh successful booster flight in a row. It was the company's first test flight since Dec. 12. Blue Origin is developing the reusable New Shepard rocket and spacecraft to carry up to six space tourists, researchers and/or experiments on brief suborbital flights, with piloted test flights presumably starting later this year. No target dates have been announced. The spacecraft features a powerful, already-tested abort system that can quickly push the capsule away from a malfunctioning booster and six large windows, each measuring nearly four feet tall and two-and-a-half feet wide that Blue Origin says will provide customers with spectacular panoramic views. For Sunday's flight, the New Shepard capsule was loaded with a variety of experiments, including instrumentation provided by NASA to measure pressure, acoustics, acceleration and other factors, along with components that will be used aboard the agency's Orion deep space capsule. Other research focused on microgravity gene expression, basic physics and tests of technology designed to demonstrate the feasibility of wi-fi delivery to spacecraft. It was the second flight for Mannequin Skywalker, a dummy astronaut equipped with instrumentation to measure the effects of the flight on an actual crew member. "He's a little sensitive about being called a 'dummy,' as he will be conducting astronaut telemetry and science studies - a very important job!" Blue Origin tweeted Friday. Along with the suborbital New Shepard rockets and spacecraft, Blue Origin also is developing a powerful new engine, the BE-4, to help boost satellites into orbit using much larger New Glenn rockets. Blue Origin has built a sprawling rocket factory near the Kennedy Space Center in Florida to manufacture New Glenn boosters and is developing a launch pad at the nearby Cape Canaveral Air Force Station. The New Glenn will compete with United Launch Alliance's upcoming Vulcan rocket and with SpaceX boosters in the U.S. launch market. In the suborbital space tourism arena, Blue Origin will be competing with Virgin Galactic, a company owned by Virgin-founder Richard Bransom that is developing a rocket-powered spaceplane to carry tourists on suborbital flights to the edge of space. Neither company has announced when they plan to launch the first private citizens.